Just watching the bus drive up to collect us in San Francisco’s Union Square is an experience. It looks like an old American school bus, with the letters M-A-G-I-C filling the sides, and a stream of bubbles blowing around it in the wind. Even the local shoppers stop and stare, as if they’ve never seen anything like it before in their lives, although the Magic Bus has been taking visitors time travelling back to 1960s San Francisco since June 2010. And with that the music changes and we’re all accompanying Scott McKenzie as he tells people to be sure to wear some flowers in your hair. Despite Rule 2, the smell of pot then wafts through the bus. Well, OK, it’s incense, but it’s close enough. As we set off in our Magic Bus, we soon find how right our guide is. It’s an experience, not a tour. Hardly surprising, as the whole thing is produced by the Antenna Theater, who’ve been around since the 1980s and for whom the Magic Bus has proved to be their longest-running production. The 3-D glasses are for us to look at some of the psychedelic art work inside the bus, but we soon take them off as a series of TV screens descends and shuts out the outside world for a while. I’d been expecting we’d drive to Haight-Ashbury and be told stuff like, ‘And this is where the Grateful Dead lived.’ But no. 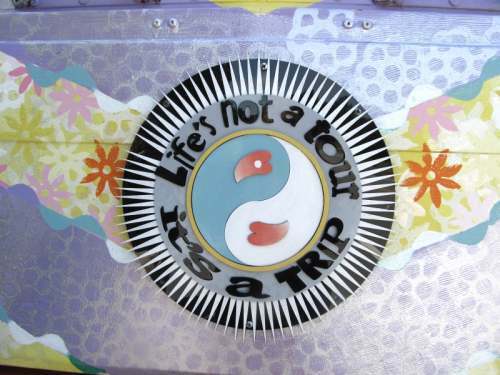 That would be a tour and, as a sign on the outside of the bus says, ‘Life is a trip’. 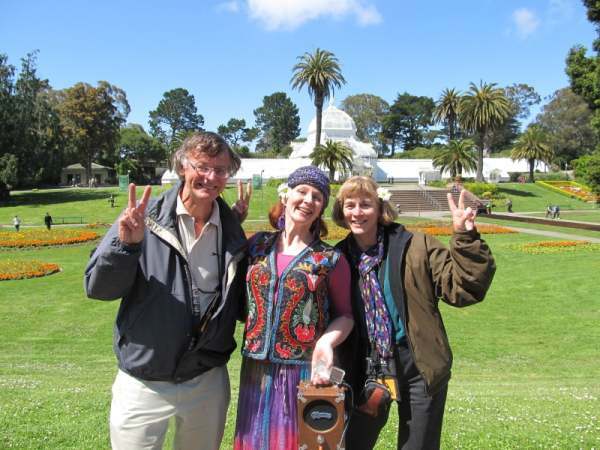 Before we get to the hippy-dippy Sixties, the specially-made documentary asks what happened in the 1950s that produced the hippy generation, and why here, in San Francisco? 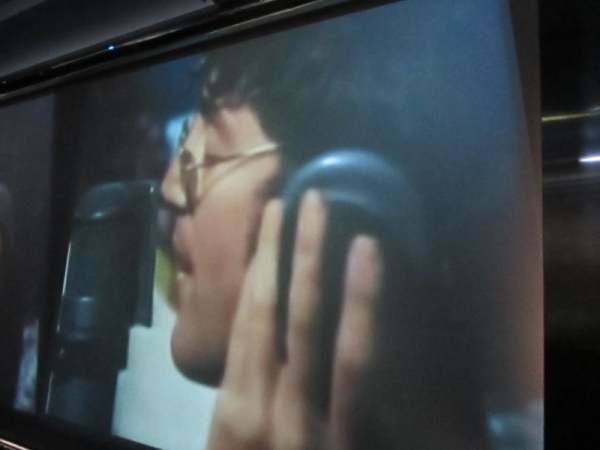 Some of the factors were the invention of the transistor radio, the arrival of Elvis Presley, and later the Beatles (‘All you need is love, love,’ we all sing) with their interest in eastern philosophies. And then, with only the first of many moments of impeccable timing, the blinds on the bus roll up and we’re in Chinatown. San Francisco has always been the most eastern-looking city in the United States, a port city, and it’s always had a thriving mixed community. And ‘We’re all beautiful golden sunflowers inside,’ the voice of Allen Ginsburg reminds us, as Jack Kerouac reads one of his haikus as we drive along Jack Kerouac Street. 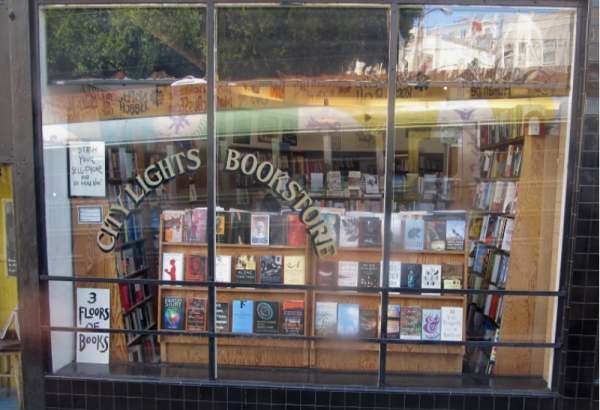 The screens go down and the screens go up just as we arrive at the City Lights Bookstore (above). Across the street is the Vesuvio Café, and we listen to a recording of Allen Ginsburg that was made there. It’s an impressive multi-layered story, as we go back even further in time to the 1950s Bus Boycott triggered by Rosa Parks in Alabama, and the Freedom Riders travelling to the south on their bus, the Sixties saying that ‘You’re either on the bus or you’re off the bus’, and suddenly it’s good to feel that you’re on the bus as Martin Luther King Jnr tells us that he has a dream, and the Civil Rights movement is another strand of what happened in the Sixties. And what’s wrong with idealism anyway? While the United States explores Outer Space, people like Timothy Leary are exploring Inner Space, and the video tells us about LSD and about pills. At which point our guide Sarah pops up and passes round some tablets for us to take… OK, so they’re only mints. After glimpsing the Golden Gate Bridge we stop for a break in Golden Gate Park, outside the Conservatory of Flowers (above) – and we’re given some flowers to wear in our hair as we stretch our legs. ‘Magic daisies,’ says Sarah, when asked what they are. Back on the bus we’re taken to Xanadu, to Penny Lane and Strawberry Fields, to The Age of Aquarius – and it’s clear that some of us want to stay there. 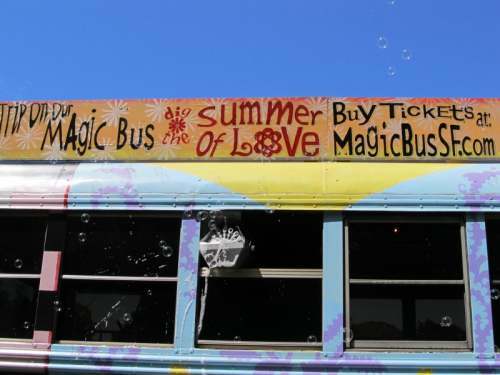 But life moves on, the bus moves on, and the Summer of Love moved on to encounter the Vietnam War. And as we’re moving on we jump back in time to remind us what happened to inspirational figures like JFK, Martin Luther King Jnr, and John Lennon. Then we’re back in Union Square, sobered but uplifted by what might have been, what some people dreamed of and worked for. ‘Try to love one another right now,’ The Youngbloods sing as we pull up back at the stop, and the bubbles are still spiralling into the air with their glistening rainbows of colour. As we leave the bus an old lady comes up and asks Sarah, ‘What’s this all about then?’ Sarah tells her, it’s a Magic Bus. The woman says she supposes it costs money. Sarah says that it does. The lady explains that she’s homeless, but she loves what they’re doing, the bubbles and everything. She thinks it’s wonderful. Sarah starts to tell her to call at their office and they’ll try to do something to let her enjoy the tour, but the old lady wanders off along the street, smiling at the bubbles. And so do we.